Metropolitan Police Commissioner Sir Ian Blair has apologised for an internal inquiry which he said caused "considerable damage" within the force. The £4m corruption probe into the behaviour of one of Britain's most senior Asian officers created a rift with black officers, he said. 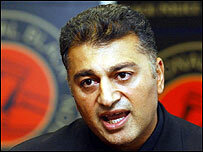 In 2001 Ch Supt Ali Dizaei was accused of fiddling his expenses and suggesting other officers had damaged his vehicle. Mr Dizaei was cleared of the charges by the Old Bailey in 2003. Sir Ian's apology came after the force and the Black Police Association agreed to resolve disputes resulting from Operation Helios. In a letter the Met Commissioner said: "All parties now recognise that it is time to move on but in so doing to ensure that lessons are learned and that mistakes are not repeated. "In acknowledging these mistakes and making this apology the Met hopes to restore to the Black Police Association (BPA) some measure of trust and confidence in our organisation." Mr Dizaei, an Iranian-born law graduate, was legal adviser to the National Black Police association (NBPA) when the inquiry was launched in 1998. The officer, who is now the borough commander in Hounslow, west London, was cleared of perverting the course of justice and misconduct in public office in 2003. The police watchdog, now the Independent Police Complaints Commission (IPCC), accused the force of "grievous errors" in an inquiry and said no disciplinary action should be taken against Mr Dizaei. That year an the Morris Inquiry was set up to look into the professional standards and employment matters with the force. The final part of the row related to the interception and handling of conversations recorded on the Met's internal phone network. The NBPA and three individuals had applied for damages arising out of the breach of their privacy. Sir Ian said today that he accepted some of the conversations were legally privileged and others confidential matters of the NBPA. 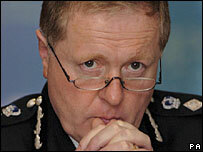 Len Duvall, chair of the Metropolitan police authority, said the move by Sir Ian was a "constructive resolution".